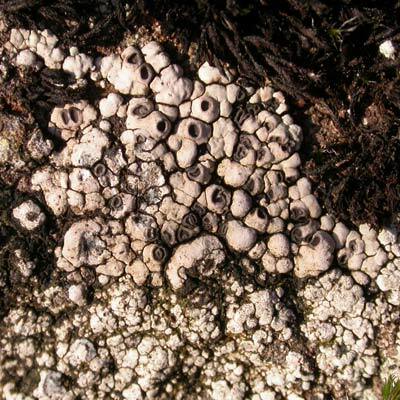 This large, spreading, crustose species of nutrient-rich rocks and walls occurs widely throughout Ireland: near the sea, alongside lough margins and more especially, on river boulders. 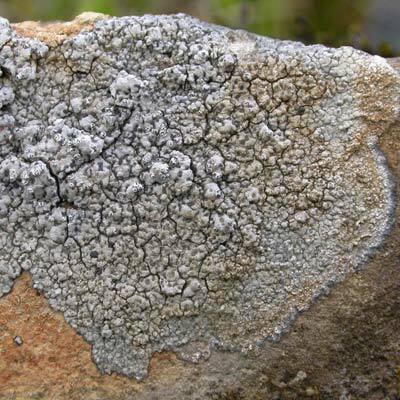 The grey thallus with a roughened, warted surface looks rather like a scruffy or crumpled version of A. calcarea (described elsewhere) which is much smoother and of an ‘ironed’ appearance and never breaks up into island pieces (areoles) of thallus. Unlike Aspicilia cinerea which is Pd+ orange and K+ red, it is both K- and Pd-. Simms, M. J., (2016). Aspicilia caesiocinerea (Nyl. ex Malbr.) Arnold. [In] LichenIreland.